Often referred to as the gem of the Amalfi Coast, Positano remains one of southern Italy's most sought-after vacation locales, thanks to its hillside location and picturesque, pastel buildings. A popular retreat for artists and writers during the 1950s and 1960s, the town transformed into cultural hub with a romantic southern Italian feel, while still harboring its historic fishing village roots. The pedestrian-only town center is dotted with hole-in-the-wall restaurants, trendy boutiques, and historic stucco homes, all nestled along steep streets overlooking the Mediterranean. Positano is in Amalfi Coast. 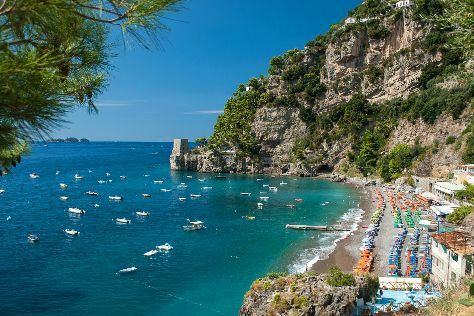 To arrange what you want to do in Positano, use our Italy visit planner. With some of Amalfi Coast's finest hotels and restaurants, Positano attracts an affluent crowd of tourists. Hotel rooms aren't cheap, but they do offer unbeatable views of the coastline. For the ultimate luxury experience, stay at one of the city's private villa-hotels, offering comfortable rooms and access to rooftop terraces, private swimming pools, and lush backyards. Stay in Positano if you prefer urban attractions, but if you want to escape the crowds, consider one of the fishing villages in the vicinity of the city.